The contents of this website are for your information and use, Pebble Grey Limited reserves the right to update or modify these terms and conditions at any time without prior notice. Our terms and conditions should be reviewed whenever you use this website. Pebble Grey do not provide any warranty or guarantee as to the accuracy, timeliness, performance, completeness or suitability of the information and materials found or offered on this website for any particular purpose. You acknowledge that such information and materials may contain inaccuracies or errors and we expressly exclude liability for any such inaccuracies or errors to the fullest extent permitted by law. This website contains material which is owned by or licensed to us. This material includes, but is not limited to, the design, layout, look, appearance and graphics. Reproduction is expressly prohibited. By placing an order with Pebble Grey Ltd you are offering to purchase a product subject to the following terms and conditions. When placing an order you are taking responsibility that all details you provide to us are true and accurate, that you are an authorised user of the credit or debit card used to place your order and that there are sufficient funds to cover the cost of the goods. Whilst we try and ensure that all details, descriptions and prices which appear on this Website are accurate, errors may occur. If we discover an error in the price of any goods which you have ordered we will inform you as soon as possible and give you the option of reconfirming your order at the correct price or cancelling it. If we are unable to contact you we will treat the order as cancelled. If you cancel and you have already paid for the goods, you will receive a full refund. All prices are inclusive of VAT. Delivery costs may be charged dependant on the location of the delivery address specified. We accept payment from Visa, Visa Electron, Mastercard, Maestro, Switch, Delta and Solo and PayPal, we regret we do not accept American Express. On receipt of your order we carry out a standard pre-authorisation check on your payment card to ensure there are sufficient funds to fulfil the transaction. Goods will not be dispatched until this pre-authorisation check has been completed. 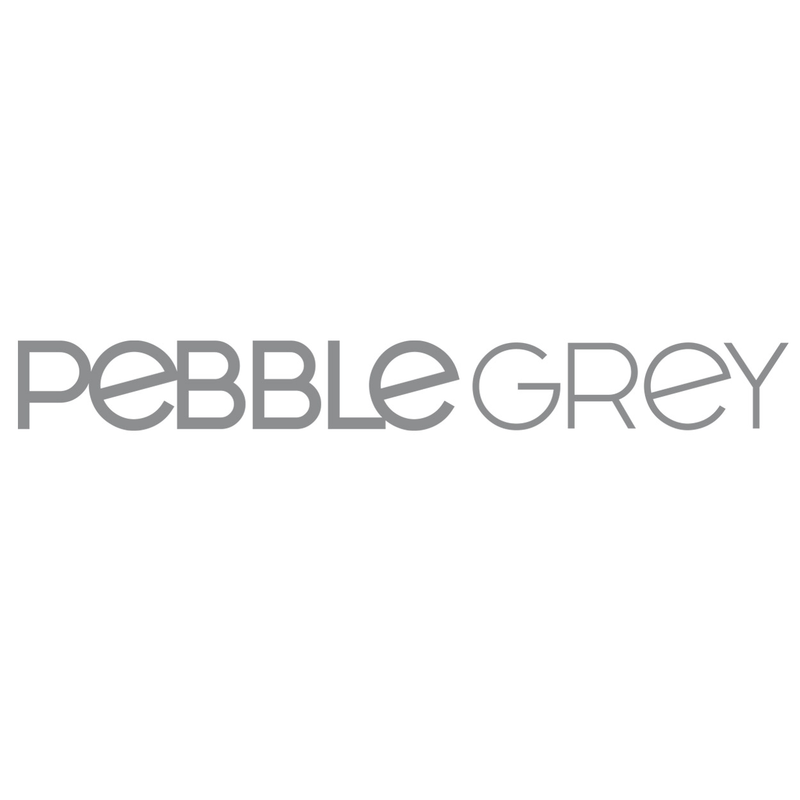 If you have chosen to purchase a Pebble Grey product you will be provided with complimentary Next Working Day Delivery to a UK mainland address provided the order is placed before 3pm Monday to Thursday or 2pm on a Friday. Weekend deliveries and premium services are also now available subject to a small charge. If an order is placed after 2pm on Friday or on the weekend your order will arrive the following Tuesday. For delivery destinations outside of the UK, please contact a member of our customer service team for assistance. You can contact us via telephone 01977 522021, or by email. Please note that Pebble Grey will not be responsible for any import duties incurred on international orders. Pebble Grey shall not be liable to the Customer or be deemed to be in breach of contract by reason failure to perform any of the Company's obligations. In relation to the Goods, if the delay or failure was due to any cause beyond the Company's reasonable control. This service is subject to a nominal fee and can be applied at the checkout phase. Orders placed over the weekend or on a Bank Holiday will be processed the next working day. Failed deliveries will be reattempted the next working day. After the third attempt the product will be stored for collection at your local Post Office or returned to back to us. By placing an order with Pebble Grey Ltd, you are confirming that the details you have submitted are correct and accurate and that you are the authorised user of the debit or credit card used to place to order. If payment has been made through a PayPal account, you are confirming that you are the authorised user of that account. Once an order has been placed you be sent an order acknowledgement via email confirming that you order has been received. A subsequent e-mail will be sent confirming the dispatch of the goods. A contract is only formed once the dispatch confirmation email has been sent. For multiple goods, only the items listed on the dispatch confirmation e-mail will form the contract. If an incorrect delivery address was specified when the order was placed, Pebble Grey Ltd will not be liable if the item fails to reach the correct address. No refunds will be given. If an error in the price, description or availability of any goods you have ordered has been found we will inform you without delay. You will be given the option of re-confirming your order taking into account the error or cancelling your order. You will be refunded in full for a cancelled order. Pebble Grey Ltd will not be liable for any damage or loss of your item during the return transit. We reserve the right to refuse an exchange or refund if goods are not returned in a saleable condition or are damaged. Should your item arrive damaged to us you will be notified by a member of our customer service team so that you can raise a claim with the courier you used to get the item back to us. Your guarantee applies from the date of your delivery, you must retain your invoice, order confirmation or extended guarantee certificate as proof of purchase and provide us you’re your warranty duration length. We offer a Guarantee of up to 10 years on all our products from the date of purchase. The warranty covers various electronic components along side a 12 month guarantee on all mirror glass. This excludes accidental damage and care should be taken to ensure your bathroom is well ventilated and the mirror surface is kept clean using appropriate glass cleaning products only. Please see our guarantee page for information of which parts are covered under the guarantee. Any defect that may arise from fair wear and tear, wilful damage; negligence; failure to follow the Company's instructions; modification of the goods; failure as a result of poor cleaning and/or maintenance; damage caused during return transit to the Company; incorrect repair of the Goods. Electrical or electronic components: damage caused by exposure to high voltages; static damage; damage caused by the mishandling of components; repairs made by an unqualified person. Any failure or defect of the Goods which was apparent upon receipt of by the Customer which has not been notified to the Company within the allocated timeframe. Any direct or indirect liability, (loss of profit, goodwill or otherwise) loss, injury or damage that arise through any such failure or defect. Please contact a member of our customer service team on 01977 522 021 or by email at [email protected] if you experience a fault with your item. We will immediately try to determine the fault and will then issue a replacement to you free of charge. if you choose to employ an electrician or other tradesperson to replace the item any cost incurred will be at your own expense. If we are unable to determine the fault of your item, we may require the item to be returned to our warehouse for inspection. Your item will be repaired and fully tested before being returned to you or alternatively if appropriate we will issue you with a new replacement item. Collections will be arranged at your convenience and will confirm a particular day, Monday to Friday, between the hours of 9am and 5pm. If for whatever reason the collection is unsuccessful the item will subsequently need to be returned to us at your own expense. In the event that you need to make a claim under your guarantee you will be required to fill in our online returns form, once completed one of our team will assess weather the fault be covered under the guarantee and approve accordingly. Once authorised you will recieve an email with instructions on how the item will be returned to us and then advise when the spare part/ full replacement will be delivered. For claims made within 6 months - you are required by law to allow Pebble Grey one oppertunity to resolve you issue in the form of a replacement part or replacement item. Should this attempt fail you have the right to ask for a refund but only once the item has been returned to us. Outside of your first six monthsy Should a replacement unit be offered but we no longer supply the item our team will provide you with an item of similar size anf features. Please be aware that you are not entitled to a full refund should your item no longer be avialble you have the right to ask for a refund which will included a deduction for fair use of 25% of the items value. Pebble Grey reserve the right to refuse refund request make outside of this time frame and therfore you will be obligated to accept a replacement item of our choosing. Please be aware that you will be asked to provide your gurantee certificate should you make a claim outside side of your first 12 months. Should this certificate not be provided we will be unable to assist you. We may cancel any order if fraudulent activity is suspected and may refuse to process subsequent orders from customers with a previous fraudulent order history. If we are unable to contact you via the telephone number or email address you provided with your order within 3 days we reserve the right to cancel your order. (In this circumstance a full refund will be actioned to the original payment method). We reserve the right to request additional proof of billing information. The sale of your order will appear on your credit card/ bank statement as ‘PebbleGrey’. If you think the amount of the sale is incorrect or have any other query please email us or call our Customer Service Team on 0845 6044 249 or 01977 522021. We operate a complaints handling procedure which we will use to try to resolve disputes when they first arise, please let us know if you have any complaints in writing to the following address for the attention of the Customer Service Manager.